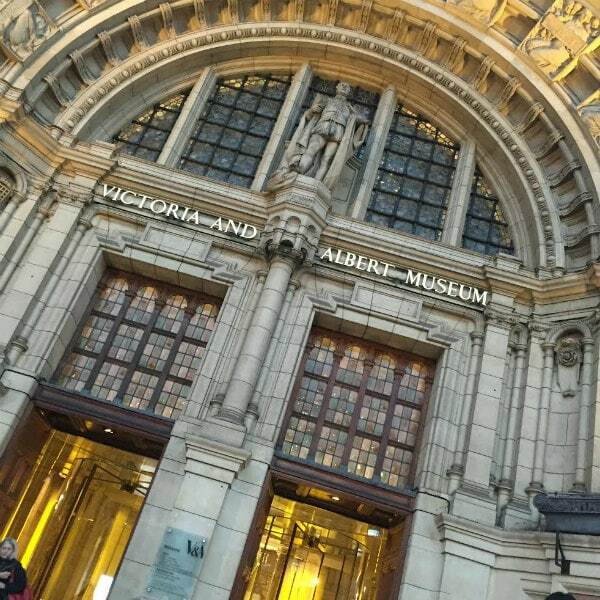 We took a mini-tour of the Victoria and Albert Museum– to see fashion, jewels and dining entertainment items from the actual period that Downton Abbey takes place (1912- 1925). It’s a beautiful museum, and it’s huge. I’d like to visit again and see more of it. 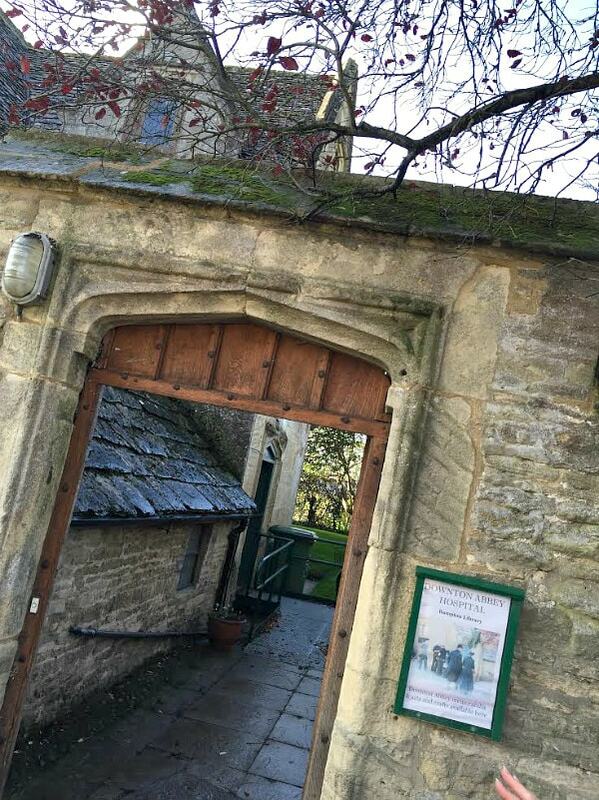 We visited the small town of Bampton, England– the fictional village of Downton. This is the town where many key scenes in Downton Abbey are filmed. 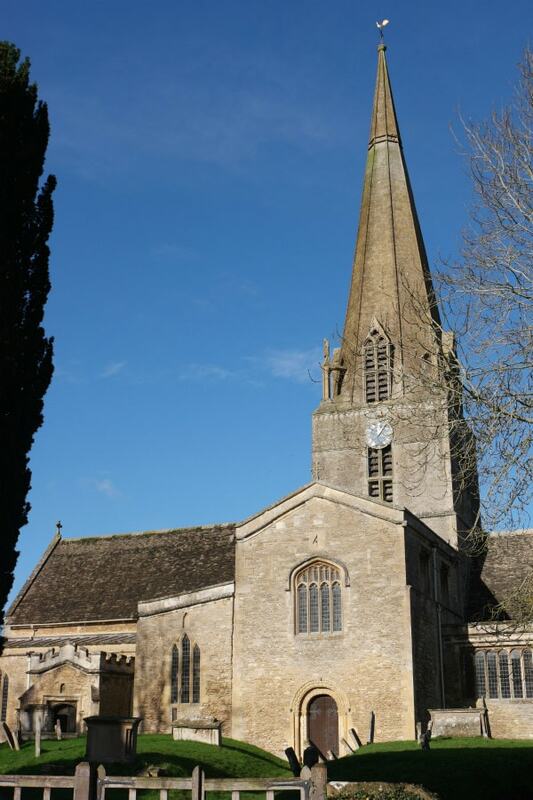 The church pictured here has hosted a number of dramatic ‘Downton’ events including weddings, funerals, christenings and even a jilting at the altar! 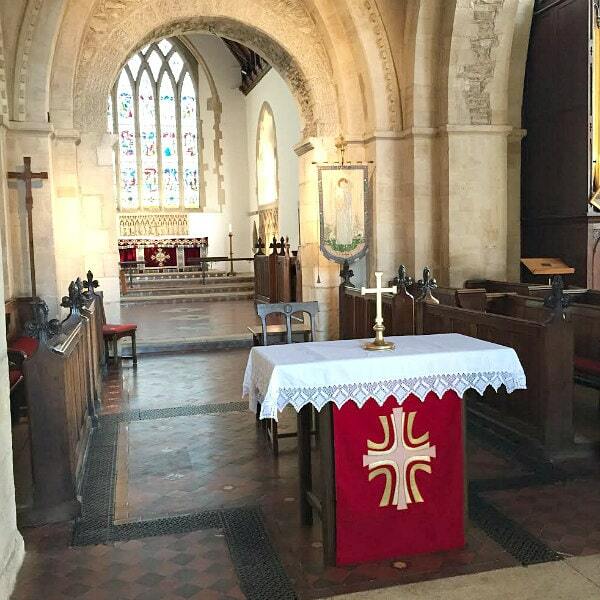 This view looking out from the front of the church has appeared regularly throughout the series. And the area in this village is home to two fictional pubs – The Grantham Arms and The Dog & Duck – both featured in various episodes. It was also the site of Downton Fair. 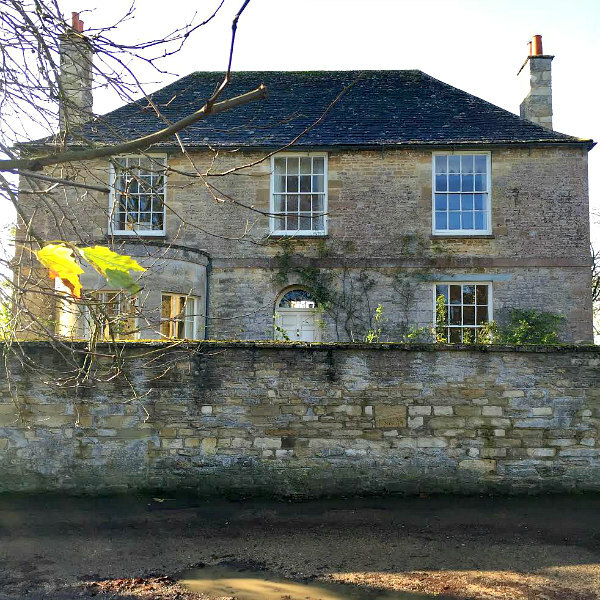 Churchgate House, the old Bampton rectory, were used for the exterior shots of Isobel Crawley’s house. There are people who actually live in this home, and they had to work with the crew on creating time for filming. 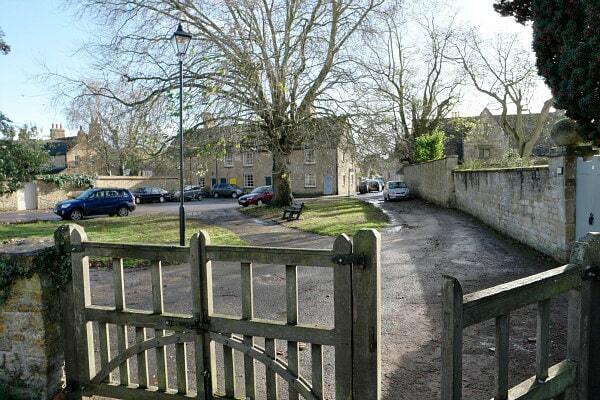 Here’s the old Grammar School building, which now houses Bampton Community Archive. It served as ‘Downton’ hospital. 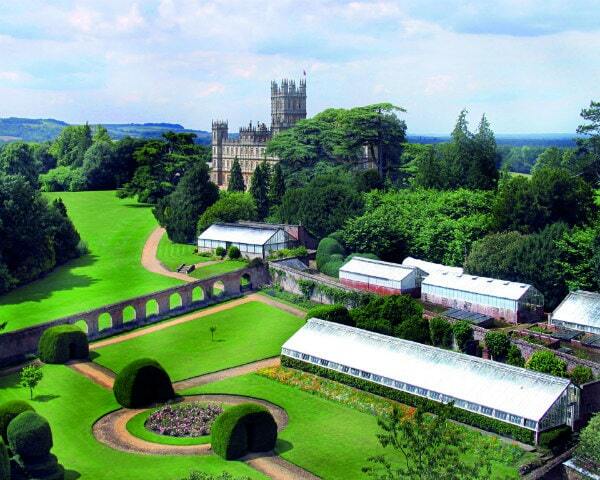 Here’s a fantastic view of the Highclere Castle estate (1,000 acres)- much of Downton Abbey is filmed on the grounds of the estate and inside various rooms in the castle. Driving up to the castle was quite an exciting experience. It had been raining our entire drive from London, and the rain stopped as soon as we arrived at Highclere. You cannot see the castle from the main road, and you must have permitted access to drive on the road that leads to the castle. It’s generally open for tours in the summer and for special events at certain times of the year. 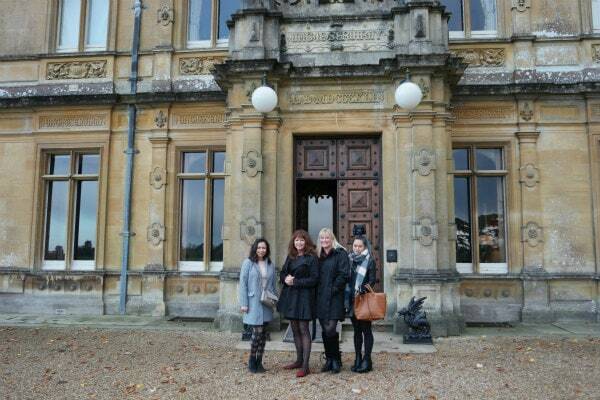 It was closed when we visited, but we were lucky enough to have been arranged a private tour. It’s such a grand sight driving up! Can you imagine living here?? This is main parlour on the first floor. There are a lot of Downton Abbey scenes filmed in the parlour, so this should look very familiar! 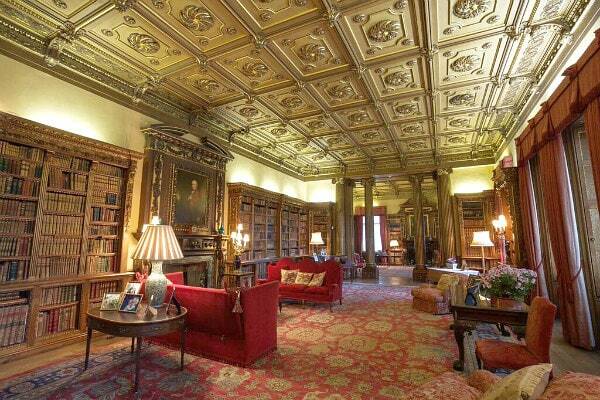 Here’s the library- quite a lot of the show is also filmed in this room. And here is the infamous dining room! So many dinner/serving scenes are filmed during meals! This is Lady Fiona Carnarvon. She is the wife of George Herbert, 8th Earl of Carnarvon. 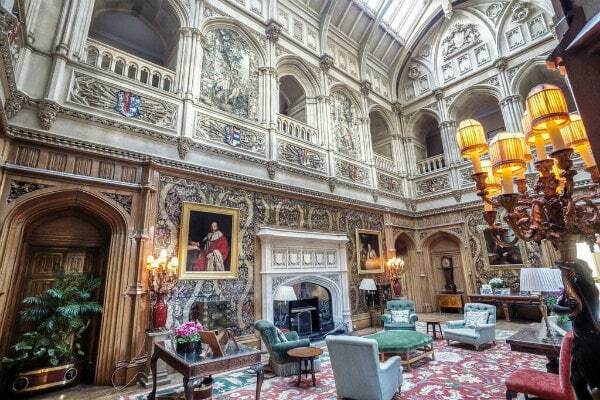 The Carnarvon family has lived at Highclere since 1679 and still lives there today! 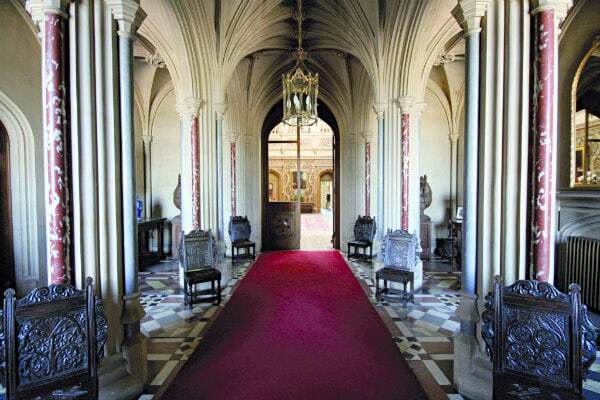 As you can imagine, it costs a fortune to maintain the castle – so the Downton Abbey filming and regular tours and events help manage the cost of keeping up this historical, beautiful place. Lady Fiona herself gave us the tour of the castle. We visited much of the upstairs- saw a few of the bedrooms that are used for filming (Sybil’s bedroom… Mary’s bedroom, etc.) And then visited most of the rooms on the first floor. She gave us a bit of history on the castle (read here, if interested in learning more). The kitchens and servants quarters on the show are filmed on a set offsite, so those are not what you see at the actual castle. Lady Fiona invited us to stay for tea. We sat around a large table and visited for well over an hour. She was gracious enough to answer a million questions. We learned that royalty has dined at the castle many times (yes, the queen and family! ), they’ve hosted many political figures from various countries, and they’re heavily into charity fundraising. An interesting note: she shared that she and her family always (always!) dress for dinner. 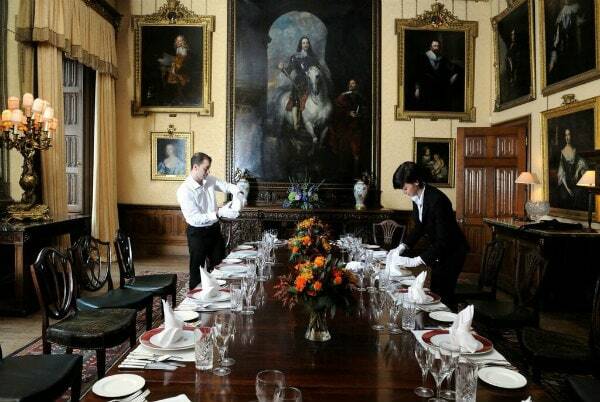 No jeans and t-shirts when dining at Highclere. Even if it’s just her and her husband, she always wears a gown and he wears at least a smoking jacket to eat dinner. Crazy! 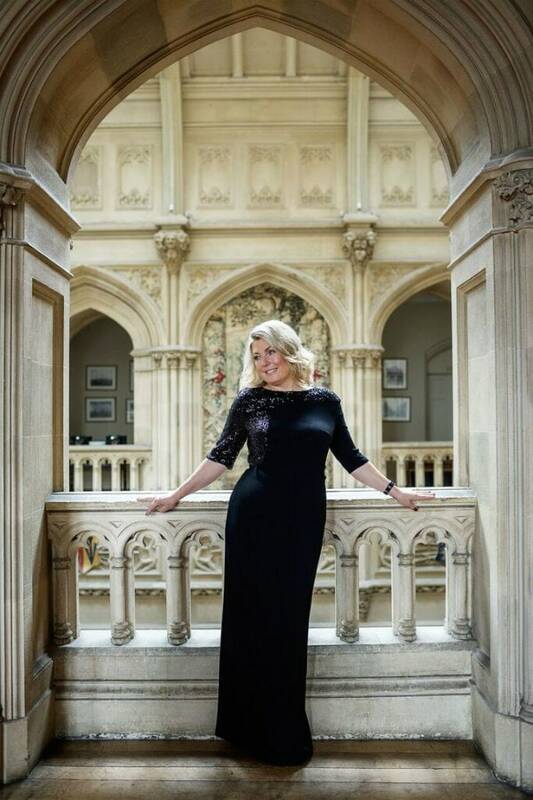 Lady Fiona has written books depicting the history and real story behind Highclere Castle. You might find this one interesting: Lady Almina and the Real Downton Abbey: The Lost Legacy of Highclere -it’s a tale covering the same period as the first two series of Downton Abbey, beginning in 1894 with the marriage of 19-year-old Lady Almina into the Carnarvon family and continuing through the Great War. 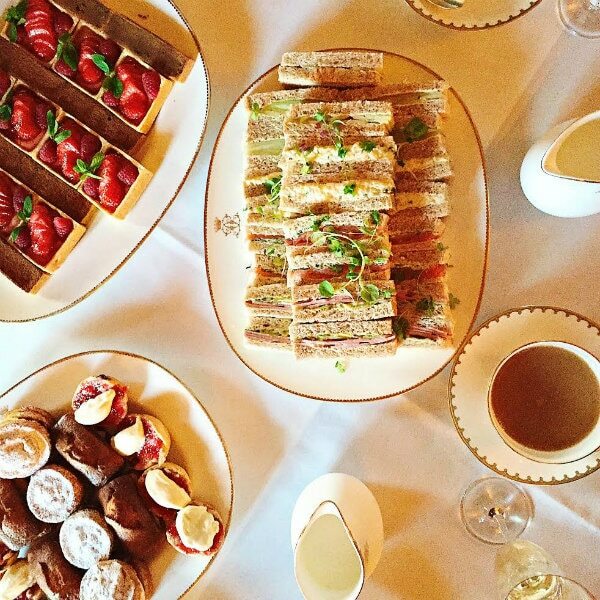 Our tea was accompanied by some lovely tea sandwiches and sweet treats. 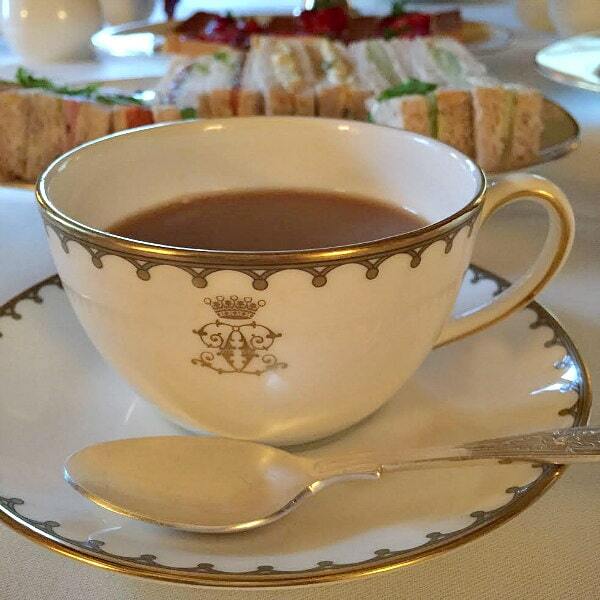 This was such a special occasion- tea in the Downton Abbey castle! 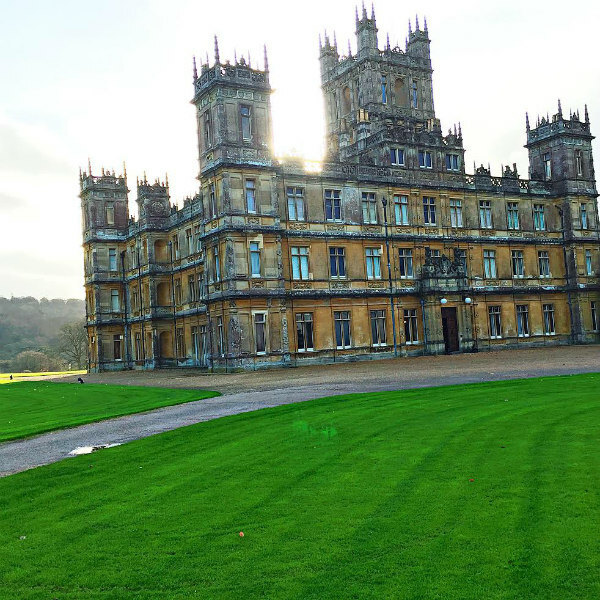 I experienced this lovely tour of Downton Abbey and London with three other bloggers- Adriana (A Cozy Kitchen), Sandy (Reluctant Entertainer) and Stephanie (I Am a Food Blog). It was a great adventure (we were all so excited that we got to do this)- truly a once-in-a-lifetime sort of thing. I’m so grateful that these opportunities come my way now and then, and it’s sure fun to share those experiences with all of you. So now that you have some background on the show and where it is filmed, will you be watching Downton Abbey this final season?? If you’re not up-to-date on the show, all seasons can be found on Amazon Prime! Disclosure: Grey Poupon generously sponsored my trip to London in collaboration of our DowntonAbbeyKitchen.com project. All opinions shared are my own. What a unique and amazing trip! I miss England so much. 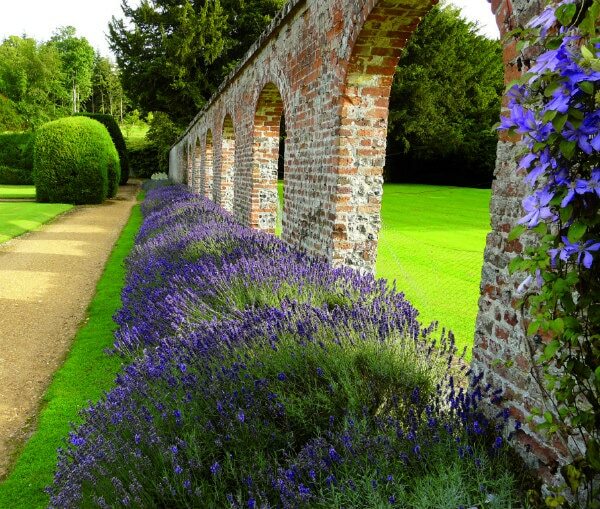 I lived there 7 years and those quaint English villages are just the best! omg this looks INCREDIBLE!!! 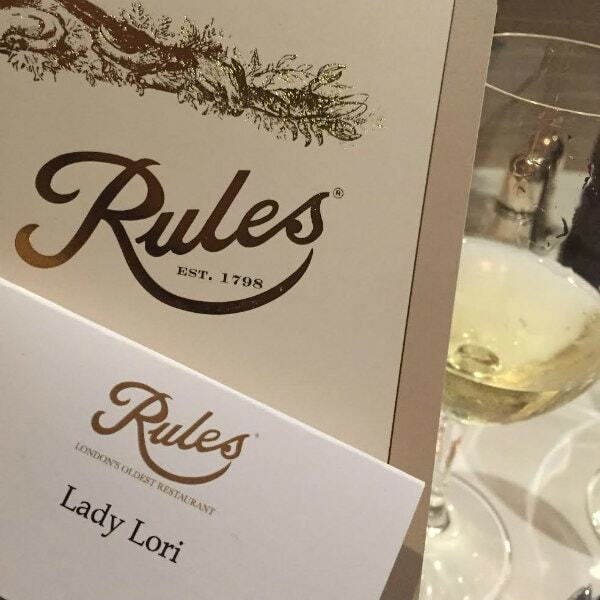 such a fab trip – love reading this at the start of this seasons of DA! oh darling, what a fun fun trip!!! I wish I could do the same trip – Lady Fiona sounds lovely and the fact that she dresses in a gown nightly for dinner? Impressive! How amazing is that! I love to hear of a family still residing in a castle, how magical! Thanks for a great post and wonderful pictures. I am so glad you got on SnapChat before this trip! I loved following every single second!!! We are HUGE Downtown Abbey fans! I’m not a Downtown Abbey fan, but I do love the UK and you gave me some great suggestions of things to do and see the next time I’m there. i was there in 1957 while i was in the Navy (sub service). GAH! What a wonderful and amazing trip! 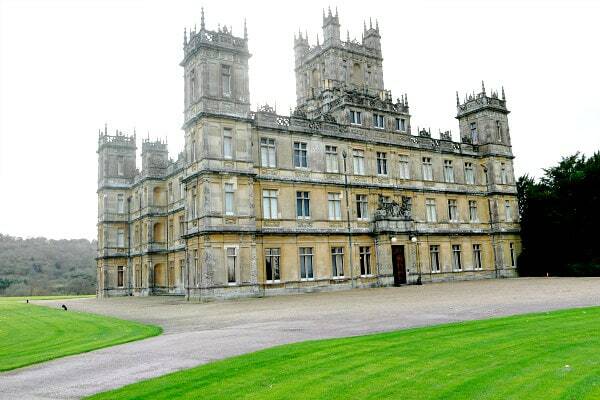 I adore Downton Abbey and I can’t even imagine how fantastic it was to step foot onto the property! oh my goodness-so amazing and beautiful! This post is amazing…I couldn’t be more jealous, what an adventure! Such a beyond phenomenal experience! Wow!